Frederick Deane RP was born in 1924 and lives and works in Snowdonia, Wales. Deane attended the Manchester College of Art (1940-43) and the Royal Academy Schools (1946-51), after serving for two years during World War II in the 1st Airborne Division The Parachute Regiment. From 1950-51, whilst still a student, he briefly worked as an artist for the advertising firm J. Walter Thompson (JWT) who produced Rowntree's marketing campaigns. He was awarded the Leverhulme Scholarship in 1951 and during the 1950s and 1960s established himself as an independent portrait artist, teaching art in Manchester. Elected President of The Chelsea Arts Club from 1973-74, Deane has gained renown for his portraits of notable figures such as Lord Florey, David Cecil, Lord Denning and Mrs Peter Roosevelt. In the 10th Battalion 1st Airborne Division The Parachute Regiment, Frederick Deane was nicknamed "Dixie Deane", after the Everton footballer who famously scored 349 goals in 399 games. Deane was seriously injured, then captured at Arnhem on 19th September 1944, and was treated at a Dutch hospital in Enschede. He was held as a prisoner of war in Stalag VII-A, Mooseberg near Munich, Germany until the end of the conflict, and reflects on his captivity in resolutely upbeat tones. Fellow inmates, Deane says, were "outrageously funny" and the nurses, who would regularly sneak in snippets of BBC news for the British soldiers were "marvellous." He says that he could often be found "sketching in the camp" or "teaching English" to a friendly Russian soldier. 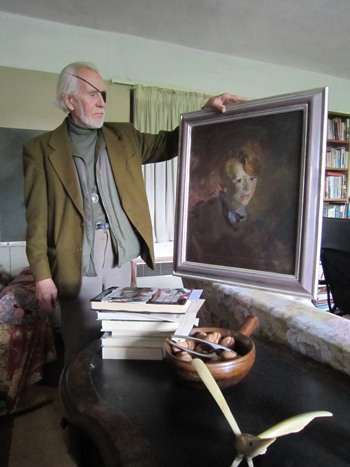 Frederick Deane RP shown with one of his portraits. By permission of Frederick Deane and Kerstin Doble. 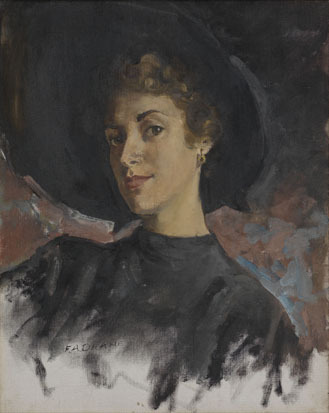 Self Portrait, c.1948-1949. By permission of Frederick Deane. Following the war, Deane submitted artwork to the Royal Academy schools. He was accepted to study there in 1946, and awarded the Leverhulme Scholarship. Even as a student, his work was in demand. Deane's Self Portrait, (c.1948-49) shown here as a b&w reproduction, was immediately noticed by Sir Oswald Birley, then President of the Royal Society of Portrait Painters. Birley invited Deane to show Self Portrait that very year in the RP annual exhibition. The painting was acquired by the famous art critic, Chairman of the National Portrait Society and great grandson of Benjamin Franklin, Francis Howard. Deane taught art in Manchester alongside major figures such as Harry Rutherford, a protégé of Walter Sickert who ran an art class in Manchester on his behalf. It was Rutherford who introduced Deane to the Chelsea Arts Club. During this time, his friend and fellow Aero artist Paul Wyeth (1920-83) also helped to elect him as a member of the Royal Society of Portrait Painters. 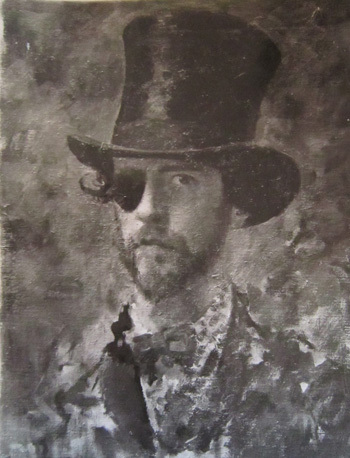 Alongside his portraiture Deane has pursued a body of work based upon the Belle Vue Circus in Manchester. Frederick Deane is thought to be the last living painter connected to Rowntree & Co. Ltd 1950s Aero Girls chocolate advertising campaign. As a young student at the Royal Academy Schools in 1948, Deane was picked out to be an Aero artist for the advertising company J.W.Thompson (JWT). Sir Henry Rushbury, Keeper of the Royal Academy Schools (1949-64) had close links with George Butler, JWT art director (1942-61), and he regularly provided the company with artists for advertising campaigns. Raymond Gabbott, fellow Aero artist, was also recruited whilst still a student. By 1951 Deane had painted multiple Aero Girls including a portrait of Rhona Lanzon, who worked in the Art Department at JWT, and the famous Vogue model Myrtle Crawford. Myrtle Crawford, c.1948-50, by Frederick Deane. 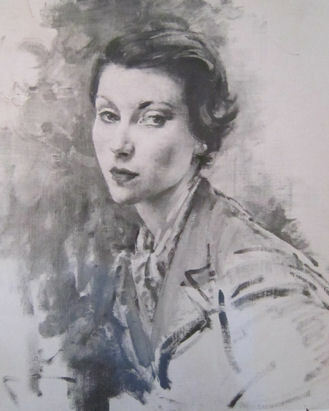 Bill Gaskell, Head of JWT's Art Buying Department from 1937 to 1965, introduced Deane to the top models of the day, such as Myrtle Crawford, and arranged for portrait sittings to take place at the Royal Academy Schools life drawing rooms. A letter sent from JWT to Frederick Deane in 1950, shown on this page, also demonstrates how closely the creation of the Aero Girl image was managed by marketing executives, who not only supplied Deane with models but also wanted to advise him 'with regard to fashion trends'. Only one of the artworks that Deane painted for the company was published in a Rowntree Aero advertisement and whilst we know that the sitter was a model, her identity remains unknown. 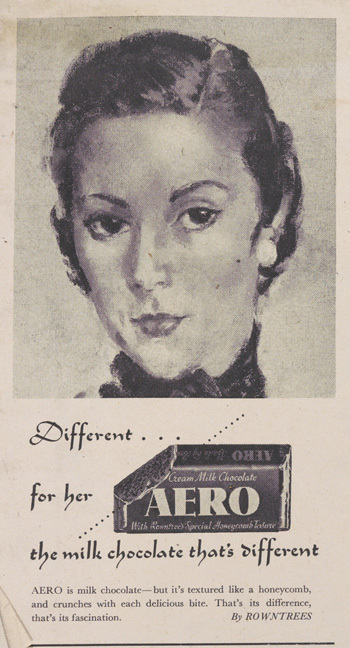 Aero advert featuring a portrait of an unknown model painted by Frederick Deane, 1950. By permission of Nestl&eacute; UK and Ireland. 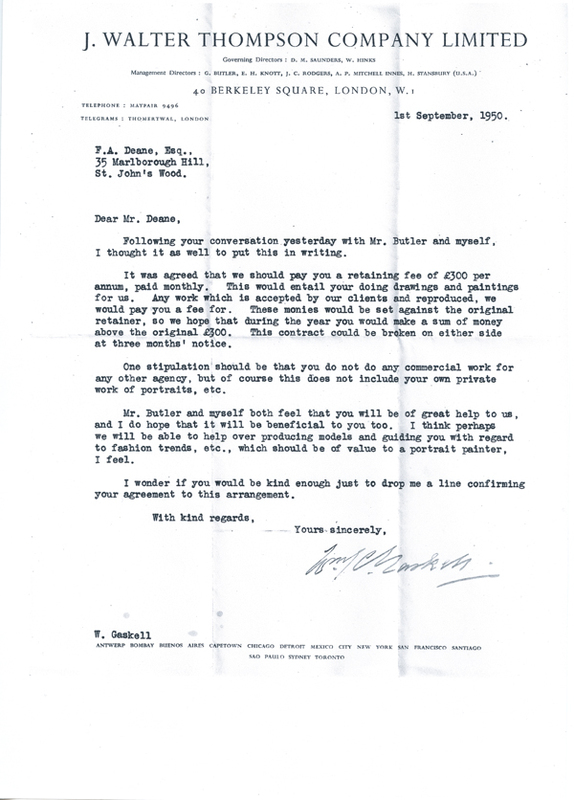 Contract letter from JWT sent to Frederick Deane, 1950. By permission of Frederick Deane. Deane‘s career as an Aero painter was short-lived. He decided against being a commercial artist, preferring to ply his own artistic course. David Buckman (2006), Artists in Britain Since 1945, Art Dictionaries Ltd.
BBC/Public Catalogue Foundation. Frederick Deane. Retrieved 2 March 2014. Royal Society of Portrait Painters. Frederick Deane. Retrieved 2 March 2014. Channel 4 News. Painter and sitter reunited. Retrieved 2 March 2014.